Welome to my site! My site will tell you about me. At the end let me know about you! Hi, My name is Jody Hibbett (Graham) I was born in McKeesport PA. raised there until the age of 13, When she remarried.When I came into this world she devoriced my dad for the sake of us kids. I have one older full brother. In the last few years I learned I have a sister and two older brothers from my dad's first marriage. I put out a search for them and found them all. I have met the olderst, but not yet met my sister and other brother. Plans are to meet them by the end of 2003. (update I am going to meet my sister in March of 2008. Still nothing on my other brother.When my mother remarried we moved to Monongahela PA. I finished school at Elizabeth Forward Highschool. In school I was in the concert band, marching band, and played Basketball, since the third grade I was involved in all these things. 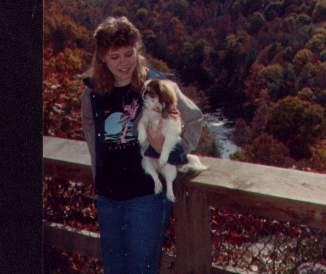 After I graduated (1988) I got me my first peke kid and moved to Florida. I have been down here ever since. I moved my mother down here in 1992 to be by me! I just had to put my first peke to sleep this year (2003), she had breast cancer for 5 years and was begining to suffer in pain all the time. She was 14 years old when I had to help her on to the Rainbow Bridge.